This page is dedicated to those employees who have gone beyond the call of duty. If you or someone you know is (or was) an employee of the telephone industry and has contributed something worthwhile to humanity, please let me know via email and I will give them recognition on this page. The "Spirit of Service" has been around since the beginning. Somehow, the providing of communications links between people has brought out the best in the hundreds of thousands of people who have worked and still work for the former Bell System and today's Regional Bell Operating Companies (RBOCs). Mr. Watson came running to assist Bell in 1876 and telephone people have been running to aid others ever since. When Theodore Vail died in 1920, a year, almost to the day, after he retired as president, a fund was set up in his memory to provide awards of recognition to telephone people both within and without the Bell System who have performed truly outstanding acts of heroism and public service. The Vail Awards, which are paid out of income from the Theodore N. Vail Memorial Fund and go to Bell System people who have put duty to others above themselves, reached their 50th anniversary in 1970. The devotion to the public that these awards recognize is still a vital ingredient of the Bell System's success, without which the human side of the business would become only routine. 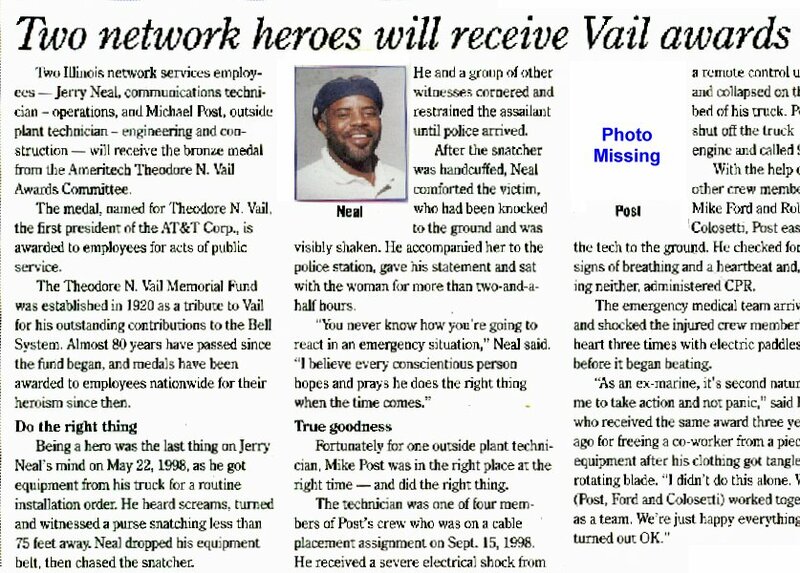 Vail Awards have gone to PBX operators who have died at hotel switchboards awakening guests threatened by fire, to operators in small towns who have saved the lives of fellow citizens from floods, to installers who have rescued people from automobile wrecks and fires, to groups of employees who have responded and banded together to face emergencies like forest fires and hurricanes. But the Vail Awards scratch just the surface. Daily acts of extra services to customers have come to be expected from Bell System employees, most of whom expect to perform them and all of whom receive great satisfaction from their performance. wife for this scan. The photo of Mike Post was missing in the scan I received. To read the newspaper article, click here.